After the ceremony, the bride and groom slip away for a private photo session before the reception festivities begin. 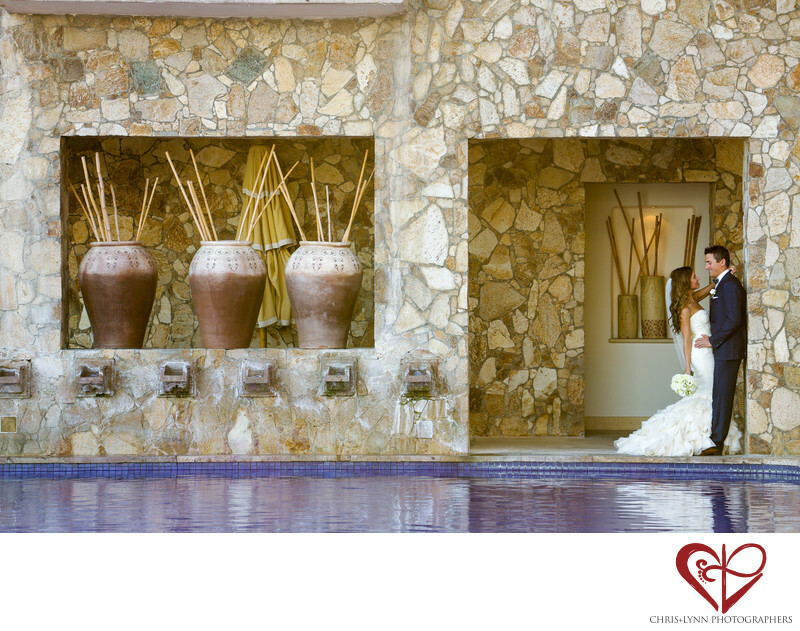 The bride and groom stare lovingly into each other’s eyes outside of a corridor that leads to a sparkling blue pool. We love the incredible architecture and decor that makes Esperanza Resort in Cabo San Lucas such an interesting and beautiful place for photographs. The bright white of the bride’s Vera Wang wedding gown contrasts with the dark blue of the groom’s Elton suit as she leans into him. Their reflection appears in the pool. The big clay pots and intricate rock patterns make this spot at the Esperanza Resort perfect for portrait photography! 1/400; f/5.0; ISO 400; 155.0 mm.